Oh me. It’s a new year. And that means a new start. Fresh beginnings. And new adventures. First, let me say thank you. For following me along on my journey through life. It’s rough sometimes. So many Scotties and anipals and friends who are now gone from this Earth. But they’re running free and We’re thinking of all of them. Each and every one. Kyla, my love, We’ll miss you always. But I felt a little kick in my kaboodle over the howlidays – seems you don’t take kindly to my moping around and being sad. And you let me know it. So, I’ll stop. Just for you. And, hey, thank you all for your howliday cards and thoughts. I tried my best to send out my own best wishes, but, as usual I got sidetracked. And I’m afraid I missed some folks. I’m so sorry. I’ll try to do better this year. In fact, I made some New Year’s resolutions. Or, as I like to call them: New Year’s Res-o-Rooo-tions. To try to do better. At lots of things. Doesn’t that look like I’m trying to do better? Yes. It. Does. What a face. Thank you very much. I like to think while I walk. I think I got a little bit too close to the edge for the peeps. It was cold that day and I think They didn’t want to come in after me if I fell. (Because you KNOW we Scots don’t swim well. Generally. Some do, but not me.) I like to keep the peeps on Their toes. If I don’t do it, nobody will. It’s my job. So, tomorrow I’ll share my New Year’s Res-o-Rooo-tions. Before I forget. OH…..and the answer to Saturday’s Where In The World riddle is…..Williamsburg, Virginia. Woooot! 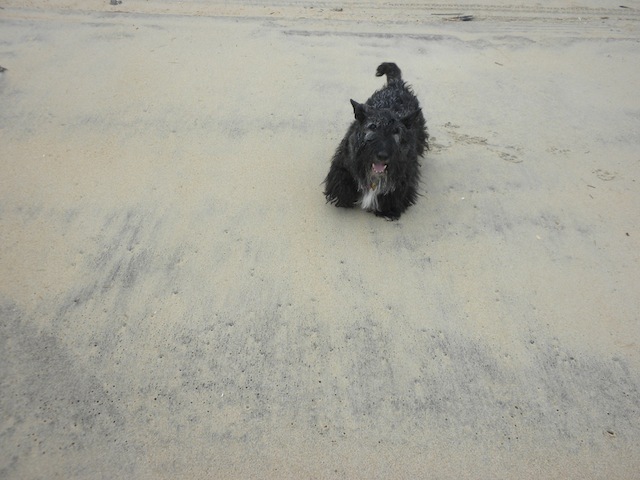 This entry was posted in Scotties, Scottish Terriers, Terriers, The Scottie Chronicles and tagged dogs, pets, Scottie, travel. Bookmark the permalink. I thought for a second you were going to jump in. “Don’t do it, Stu” I squawked. You must have heard me. Stuart! We got your card – you look extremely handsome on it!! That was a very impressive run on the beach, Stuart! It’s hard to run in sand! But please be more careful when you are on a dock – don’t walk so closes to the edge if you aren’t wearing a life preserver! Please be careful on the boardwalk. Andy and me would sink like a stone, but Elsa can swim. We are square and she is linear.You are a bright spot in our lives. Thank you Stuart! That beach look pretty nice Stuart! Yeah you had us all on the edge of our computers when you were walking on the dock! Stauart you can really strut your stuff in Scottie style.